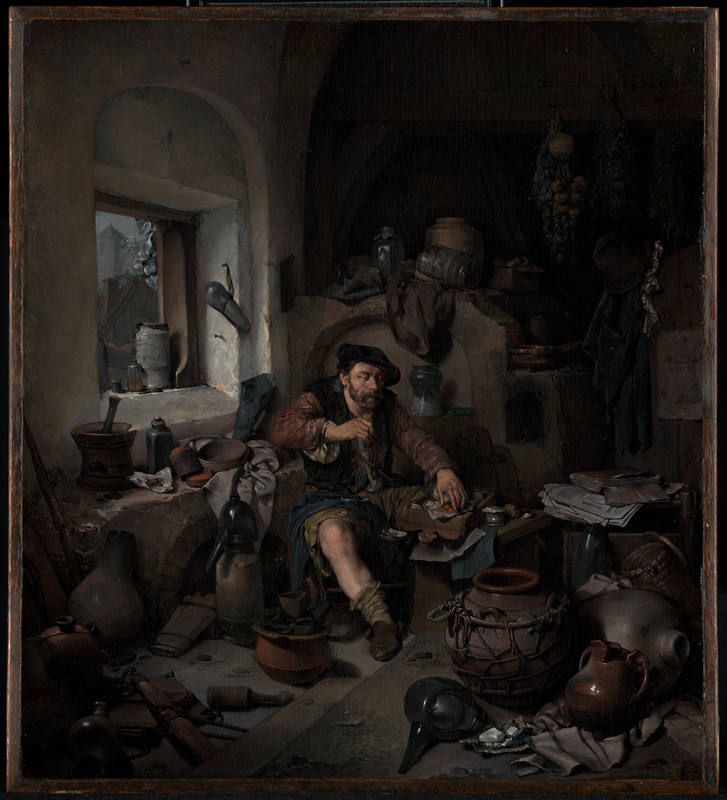 Center, on blue paper: "A° 1663 C bega"
Oblivious to his cluttered surroundings, the unkempt figure of an alchemist sits among a chaotic jumble of paraphernalia. He holds a scale while weighing out a substance for one of his experiments in making gold. By the seventeenth century, alchemy was no longer considered to be a respectable science, and its practitioners were often the subject of ridicule. In this genre scene, Cornelis Bega commented on time wasted on materialistic and futile pursuits. Like other Dutch artists of his time, Bega was a close observer of natural appearances. Textures and surfaces of the assorted cracked clay and glass vessels are accurately described. Light pouring in through the open window and the harmonious tones of brown, gray, and blue give the painting a cozy warmth. Source: Paillet, Paris. Catalogue des tableaux [...]. February 21, 1781 (annotated catalogue). H. Shickman Gallery (New York, New York), sold to the J. Paul Getty Museum, 1984. Paillet, Paris. Catalogue des tableaux précieux, des plus grands maîtres des écoles flamande & hollande; qui composoient le Cabinet de Monsieur le Duc de la Valliere. February 21, 1781, p. 30, lot 78. Christie's, London. A Catalogue of the Valuable [...] Pictures of his Royal Highness, the Duke of York. April 7, 1827, p. 7, lot 93. Christie's, London. Pictures by Old Masters. The Property of J.C.W. Sawbridge-Erle-Drax and others. May 10, 1935, p. 15, lot 70. Read, John. "The Pope Collection of Alchemical Paintings and Engravings." Nature 147 (February 22, 1941), p. 243. Lennep, Jacques van. "L'alchimiste: Origine et développement d'un thème de la peinture du dix-septième siècle." Revue belge d'archéologie d'histoire de l'art 35 (1966), p. 160, no. 11. Bader, Alfred. "Cornelis Bega's Alchemist: A Problem in Art History." Aldrichimica Acta 4, no. 2 (1971), pp. 17-20, cover ill.
Kremers, Edward, and Georg Urdang. Kremers and Urdang's History of Pharmacy. 4th ed., rev. by Glenn Sonnedecker (Philadelphia and Toronto: Lippincott, 1976), p. 44, ill.
McTavish, David, ed. Pictures from the Age of Rembrandt: Selections from the Personal Collection of Dr. and Mrs. Alfred Bader, exh. cat. (Kingston: Agnes Etherington Art Centre, Queen's University, 1984), p. 62. Scott, Mary Ann. "Cornelis Bega (1631/32-1664) as Painter and Draughtsman." Ph.D. diss. (University of Maryland, 1984), p. 334, no. 146. Sutton, Peter C., ed. Masters of Seventeenth-Century Dutch Genre Painting, exh. cat. (Philadelphia: Philadelphia Museum of Art, 1984), pp. 133-34, no. 3, pl. 34, entry by Peter C. Sutton. "Acquisitions/1984." The J. Paul Getty Museum Journal 13 (1985), pp. 208-9, no. 135, ill.
Kelso, William M. Jamestown Rediscovery I: Search for 1607 James Fort (Jamestown: Association for the Preservation of Virginia Antiquities, 1995), p. 11, fig. 17. Scott, Mary Ann. "Cornelis Bega." In The Dictionary of Art. Jane Turner, ed. Vol. 3, B to Biard (London: Macmillan, 1996), p. 495, ill.
Jaffé, David. Summary Catalogue of European Paintings in the J. Paul Getty Museum (Los Angeles: J. Paul Getty Museum, 1997), p. 8, ill.
Kelso, William M., and Beverly A. Straube. Jamestown Rediscovery VI (Jamestown: Association for the Preservation of Virginia Antiquities, 2000), p. 37, fig. 36. Franits, Wayne. Dutch Seventeenth-Century Genre Painting: Its Stylistic and Thematic Evolution (New Haven and London: Yale University Press, 2004), pp. 140-42, 282n43, fig. 126. Clippel, Karolien de. "Two Sides of the Same Coin? Genre Painting in the North and South During the Sixteenth and Seventeenth Centuries." Simiolus 32, no. 1 (2006), pp. 30, fig. 12. Glatstein, Jeremy. "Sigismund Bacstrom's Alchemical Manuscripts." Getty Research Journal 2 (2010), pp. 166-67, fig. 4. Lindemann, Bernd Wolfgang. "Begas malerische Virtuosität." In Cornelis Bega: Eleganz und raue Sitten, exh. cat. Peter van den Brink and Bernd Wolfgang Lindemann, eds. (Aachen: Suermondt-Ludwig-Museum, with Belser, 2012), p. 33. Brink, Peter van den, and Bernd Wolfgang Lindemann, eds. Cornelis Bega: Eleganz und raue Sitten, exh. cat. (Aachen: Suermondt-Ludwig-Museum, with Belser, 2012), pp. 243-46, 283-84, no. 70, ill., entry by Sylvia Böhmer.